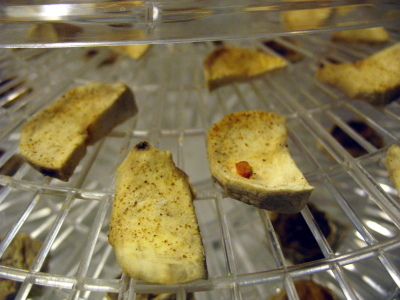 I've been thinking about ways to store food from my garden -- particularly my potatoes, tomatoes, and apples, as those plants have produced more at one time than we can eat. I considered buying a used fridge to keep in my garage for cold storage of potatoes and the such, but I think I've come up with a better solution: dehydration. 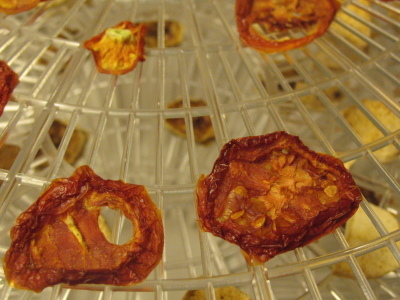 I looked around on some DIY sites to see about making my own dehydrator. 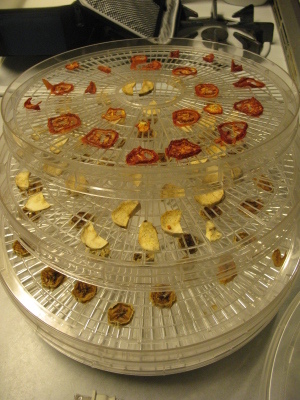 A dehydrator is apparently a very simple contraption - just a box, a heater, and a fan. 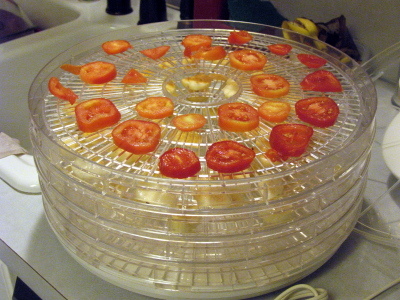 I've got a few spare parts sitting around to make one, but because I want to start dehydrating right away, I figured I'd throw $35 at a "real" dehydrator. Pretty simple instructions: slice food small and stick it on the trays. There's no settings to adjust, no knobs to turn -- you just plug it in. Easy enough. For this first batch, I've got tomatoes, potatoes, and bananas. And 12 hours later, I've got dehydrated food. The tomatoes were perfect. 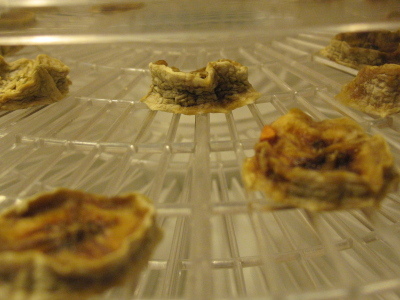 They instantly rehydrate, so you can just eat them dry or throw them into a bowl of Ramen like I did. Potatoes are a little different. They take longer to rehydrate, so just popping them in your mouth isn't the most pleasant experience. Boiling them for a few minutes would be a better option. The bananas were as expected - they're banana chips. But as I don't grow my own bananas, I don't expect to make many batches of them. At this point, I've also done apples, which make a decent enough snack. And at the moment of this writing, I've got celery and zucchini drying out, and I expect those to be great for throwing into a soup. slung blade - ha! I'll figure out a way to do that one eventually. The Schauflers used to have one of these and I thought they were the coolest thing every when I was about six years old. :) I still do, actually. Where did you get it? I have bags overflowing with tomatoes from this season. For preservation, I was actually thinking of making spaghetti sauce. Allison has made 3 batches of salsa from our tomatoes. All delicious. All devoured!!! Ken - that's awesome, man! What kind of tomatoes did you grow? I only planted Roma tomatoes, as I prefer the stronger flavor. Large tomatoes don't have nearly as strong of a taste. Nice thinking on the spaghetti sauce! That's a great idea.